Is this the return of the Cod? The Cod season so far this year has not been as good as last year, but to be honest that was to be expected. There was no great number of 1 year old Cod last winter, so the fish that are around this year are the same fish we were seeing last year. If you remember they were mostly 2-3lb, but since then they have mostly doubled in size. A wider distribution, predation and large catches, have reduced the number of Cod being caught in large numbers this year. The good news is that the larger fish we normally see in December seem to be returning. Catch reports from all along the South coast and especially the Bristol Channel suggest that a good number of double figure Cod are showing up. Tides and conditions for this weekend look good. There is a few hours that look a bit windy on Saturday afternoon, but apart from that it looks exciting. I have my bait ordered and it looks like Chesil will be fishable for me from about 9am. I am hoping to get myself a nice double just like Darren Mills managed around this time last year. Elsewhere fishing has been reasonable and some of the marks that are out of the wind have proved once again that Chesil is not the only beach to fish. Ryan Casey spent a couple of days fishing over at Poole. 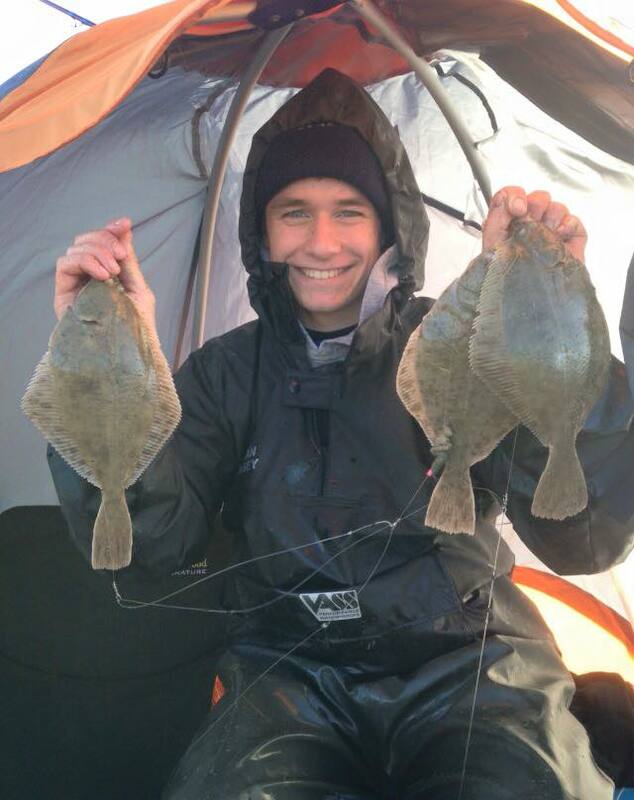 He was rewarded with 24 Flounder up to 1 1/2lb. 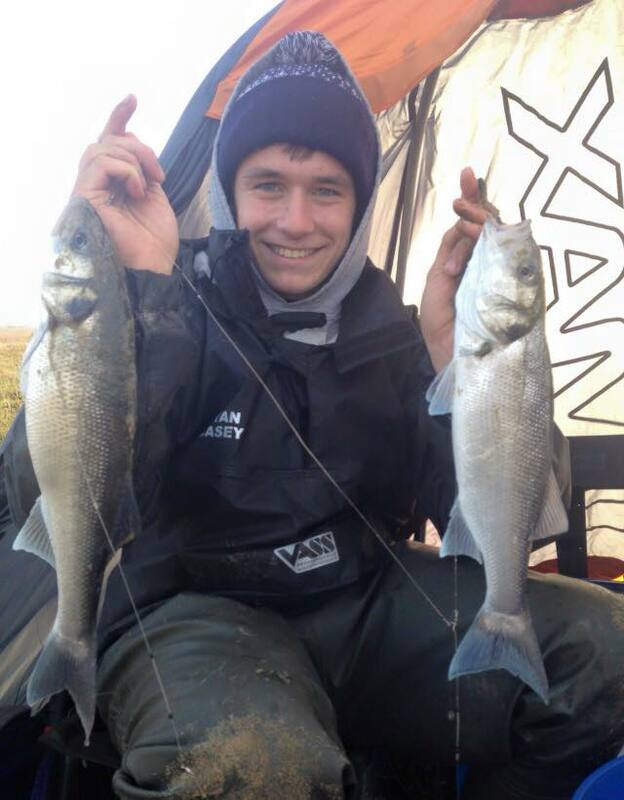 Ryan being one of the luckiest anglers I know managed to bag himself a few Bass as well. Hos biggest went 4lb 2oz and he even managed a double shot of these two. He assures me that luck has nothing to do with it! Chesil Beach forecast: It won’t be easy fishing on Chesil until it calms down a lot more on Sunday, but it is in these rougher conditions immediately after a big blow that I wait for. Don’t take any chances, keep a good distance from the waters edge and even consider wearing a life jacket or a flotation suite. It will go one of two ways this weekend. It will either be a Cod Fest, which is what we are hoping for, or it will be rubbish. My gut instinct is it will be great fishing. My main worry is that the sea will be full of Pout, Whiting and Dogfish, all waiting to rob your lovely big Cod baits. At least if they are there in numbers you wont be bored. There is also a good chance of catching a decent Bass in the rough conditions. As usual after a big blow you want big baits. Live Peeler Crab, Lugworm, whole Squid or large Cuttlefish baits should all work well. Portland: Bull Huss and Conger should all be possible whilst the water is so coloured. Normally you would only target these at night, but it may well be worth it during the day, at least until the water starts to clear. When it does clear there will be lots of hungry Wrasse all looking for a feed. Ragworm fished on a rotten bottom will certainly get you amongst the fish. Portland Harbour: With big tides this weekend the harbour should be good for Bass once again. Normally at this time of year I would expect this to be one of the last tides that I would expect to see any numbers of Bass. However the water temperature is still above 12°c. The Bass don’t normally start moving away to their spawning grounds until it falls below 11°c. When targeting Bass this late in the season I normally switch back to the smaller lures, or stick with my favourite Pro-Q surface lures. Weymouth Bay: It had been my plan to get out with my LRF tackle and have a go in the harbour this week. Unfortunately time got the better of me. However I may try it over the weekend if I get a chance. There are still lots of different species being caught from the piers. Preston normally fishes well on the big tides as it allows you to hit marks over low water, that are not normally accessible. One word of warning if you are going to fish the Bowleaze Cove area, if you cast too far you will end up in the reef and lose your tackle. 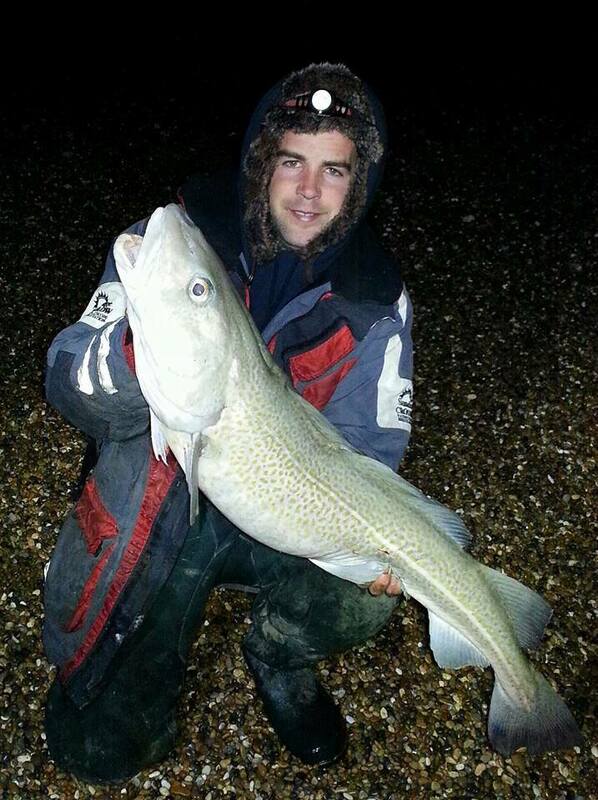 Fishing Tails > All Articles > Reports > Chesil Beach > Is this the return of the Cod? 3 Responses to "Is this the return of the Cod?"